I’ve blogged several times about home pizza construction, but I’ve never addressed the importance of not letting your pizza dough get warm before it’s slid onto the pizza stone, which would affect the “slide” effect. Confused? Let me explain. All you need (minus the stone). Thin slices of fresh mozzarella are the crowning glory. I always assemble my pizza on a cornmeal-dusted pizza peel, then – after assembling the ingredients on the canvas – I slide it from the peel onto the hot pizza stone in the oven. If the dough is warm, it could stick to the peel and cause a big mess when you’re trying to slide it into the oven. The dough could stick to the peel but the toppings will move forward, sliding onto the stone minus the dough. Not good. I’m speaking from experience, having been on the “learn while you burn” plan most of my life. For instance, the first time I experimented with the following recipe, I put warm garlic spinach on top of the pizza dough, causing the pizza dough to warm up and stick to the peel. When trying to slide the pizza onto the stone… well, by now you can tell what happened. 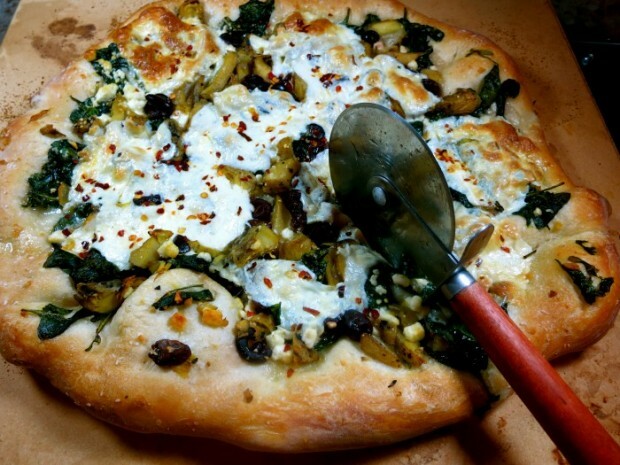 Therefore, if you decide to make this recipe – and you really should, it’s delicious – make sure you chill your garlic spinach before spreading it across the doughy canvas. BTW: I purchased the “Monterey Farms Artihearts” grilled artichoke hearts from Hillers. They’ve a meaty, grilled essence of artichoke flavor, which I especially love chopped and strewn across pizza. Heat olive oil over medium heat in a heavy-bottomed saute pan. Cook garlic a minute or two or until fragrant; stir in spinach and continue cooking, stirring, until spinach is barely wilted, about 1 minute. Remove from pan and refrigerate. Dust pizza stone with corn meal then place cold pizza stone in oven; preheat oven to 420 degrees. Place thawed dough on a pizza peel that has been dusted with cornmeal; pull edges of dough out slightly and let dough rest 15 minutes, or according to package instructions. While dough is resting, assemble ingredients. Stretch dough into a large 10-12 inch oval, circle or rectangle. ( I prefer a a thin crust, so stretch it thin.) 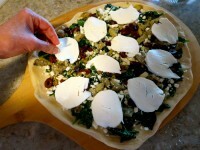 Arrange chilled garlic spinach over top of pizza, then sprinkle artichoke hearts, feta and olives over top. Arrange mozzarella over pizza, then brush edges of exposed crust with olive oil. Shake pizza gently on peel to insure it slides, then carefully slide pizza from pizza peel onto hot pizza stone and bake pizza until crust is golden brown, about 17-20 minutes. 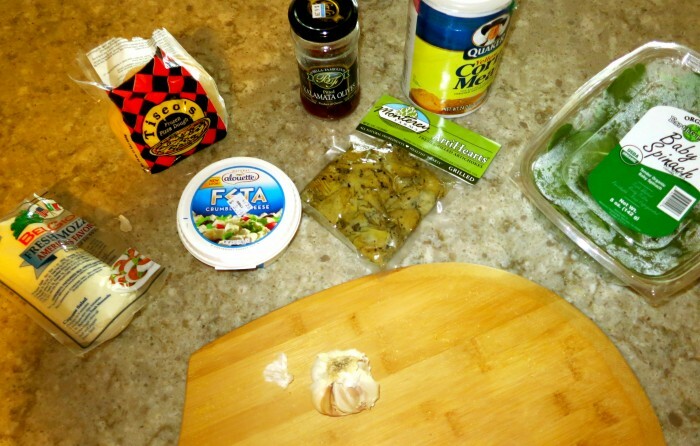 *Canned or marinated artichoke hearts, drained and chopped,may be substituted from the grilled. Peggy – Please let me suggest an alternative to corn meal. Corn meal is messy and inevitably ends up in the oven, where it burns and smells. Besides, it’s not that good a friction-reducer. The solution? Silicone treated baker’s parchment. I’m not sure why this hasn’t become more popular with amateur cooks. I suggested it all the time when I taught classes at Kitchen Port and Ann Arbor Community Adult Ed. It’s available in 15″ wide rolls. While I buy 18×36 sheets, 1000 to a box for my business, I also use in rolls. I just got one at Costco. Lay your flattened crust on a sheet and load it up with toppings. You can slide a peel under it (pulling the edge of the parchment helps move the pizza), then slide the pizza, parchment and all, onto the stone. No chance of it sticking to the peel. You can pull the parchment (and pizza) slightly off the peel first and lay that edge on the back of the stone, then pull the peel out from under it. Another trick – you don’t have to have a peel since you’re not reaching all the way into a deep oven. Just use a piece of cardboard the right size. You can assemble the pizza on it and eliminate one transfer. Hope this makes pizza making a little less fraught with potential disaster.